If you've been to Graceland, you'll know that opposite the old house, on the other side of Elvis Presley Boulevard, is a undistinguished looking collection of museums and shops dedicated to the memory (and estate) of 'The King'. While some of the exhibits are remarkably evocative, others are the subject of only the most optimistic of tenuous links. Elvis's musical legacy, however, lives on not just in the never-ending radio play of his songs but through his own flesh and blood, specifically daughter Lisa Marie. 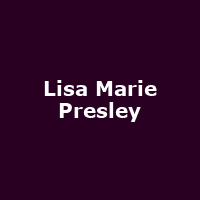 The only child of Elvis and Priscilla Presley, 'LMP' has managed to carve out a successful music career in her own right. Yes, she inherited the Presley estate in 1993 and her face can never mask the shadows of her father's face, but her studio albums have all been hits. Her first, 2003's To Whom It May Concern, reached No 5 on the main Billboard countdown and the follow-up, 2005's Now What?, also made the Top Ten. Lisa Marie's third studio record, Storm & Grace, is released here on 15th October. Ahead of the issue, the singer will playing her first ever headline gig in the UK in a little over a week's time (although she did join Richard Hawley on stage at the Shepherds Bush Empire back in 2009. Lisa Marie will be playing this very special one-off show at London's Bush Hall on Thursday 4th October 2012. We will have tickets available from 9.30am tomorrow, Wednesday 26th September, priced £29.50.